What does Star Wars, reading, and movie quotes all have in common? They have EVERYTHING to do with Angel Ellis, JangoMail's Onboarding Specialist! 1. What is your position at JangoMail? 2. How long have you worked for JangoMail? 3. What do you like best about working for JangoMail? I enjoy the people of JangoMail most. Our team has created a helpful and enjoyable place to work while striving towards improvement both individually and as a team. Professionally, each of us has specific strengths to put forth. Relationally, we're all quirky individuals. Altogether, it makes working for JangoMail a fun and fulfilling experience. 4. What feature do you like most? Personalization. Whether it's simply adding a first name to make it personal or employing conditional logic to tailor a completely unique message for your recipient, personalization can truly set you apart from other marketers. The possibilities are limited purely by your imagination. 5. What is your educational background or what experience led you here? My educational background is in Biblical Studies, and I have customer service experience. 6. What is your favorite hobby / pastime? I would definitely say reading or spending time with family and friends. Whether it's a lazy night in or an evening combo of dinner and a movie, I love both! Also, I'm a closet nerd that thoroughly enjoys Star Wars and Lord of the Rings. While I certainly haven't read them all, I am enjoying the ones I am. Bring on the books! Chocolate. Specifically, Dove Milk Chocolate and Kit Kats! 8. Any interesting facts you'd like to share? I have a tendency to use quotes from movies or TV shows as standard fare in conversation. It isn't always something obvious! It could be a completely normal phrase with the right inflection that calls to mind a certain movie. Most of the time, I just get blank stares in response, but there are those rare times when I get a look that says, "I understand that reference!" How do you manage multiple email marketing campaigns for different clients, departments, or organizations in a JangoMail account? Use the JangoMail sub-account feature. go to 'My Account' and click the 'Sub-Account' tab. The sub-account feature allows you to set up and manage multiple user accounts within a main JangoMail account. Each sub-account has a unique user name, password, and from address domain. All managed by the administrator within a main account. The account settings such as header/footer and unsubscribe list can be unique to each sub-account or can use the master accounts settings. The main account administrator maintains complete control in setting up and monitoring these parameters for each sub-account. Once a sub-account is set up, contact lists and email marketing campaigns can then be created and stored in each sub-account folder, separate from other sub-accounts. The sub-account can be managed either directly through the login or through the master account. This simplifies management and organization of multiple email campaigns for various customers, departments, or organizations. The sub-accounts created in a master account are functionally separate, and are not billed individually for usage. The billing is done only for the main account to allow for the lowest cost per email of the combined total sending volume, a true cost savings. To set up this feature, call a JangoMail expert at 1-888-465-2646. Once your master account is confirmed, log in and go to 'My Account'. Select the 'Sub-Accounts' tab and click 'add a new item,' which will open a new window where you can create a username, password, from address, domain, and sub-account settings. Once everything is entered, Save your settings and, congratulations, you just create a new sub-account. It's that easy! Using the JangoMail sub-account feature allows for the flexibility that marketing, design, public relations, communication, and other business types need to simplify their account management. All the billing and email marketing services are met by the needs of multiple customers. What does peanut farming, kettle chips, and four sevens all have in common? They have EVERYTHING to do with Jaime Holton, JangoMail's Senior Accountant! 4. What is your educational background or what experience led you here? I have an Associate's Degree in Business Management and just finished my Bachelor's Degree in English / Sociology. I have been in accounting since 2006. 5. What is your favorite hobby / pastime? 7. Any interesting facts you'd like to share? I'm a farmer's daughter. My dad was a cotton and peanut farmer, and a rancher. I grew up driving tractors and working cattle. I believe in a strong work ethic. 8. Do you have a catchphrase, funny saying, or personal quote? I don't, but I hate the saying, "It is what it is." This tells me that there is no way to change or improve whatever you are talking about. 9. Anything else you'd like to share about yourself? My birthday is 7/7/77 and everyone says I must have good luck. I do not. Do not take me gambling. You will lose all your money. I don't even try anymore. Bob's business is growing. Bob's sales staff needs to use email to make more connections with leads, and to promote more sales to existing customers. Bob's sales staff, however, isn't so great at learning new things. Bob already has his own software to run his business, and his sales staff doesn't like going outside of it to use other tools. Bob needs his sales staff to use JangoMail's tools, but he wants them to do so directly from his own sales software. After all, his IT and development staff have worked hard to make his software work very well for his purposes. That's why Bob uses the JangoMail API. API stands for Application Programming Interface. The JangoMail API lets Bob's developer connect his software directly to JangoMail. Now Bob's sales staff can create messages, build contact lists, and send campaigns directly from Bob's own software. Bob's sales software, with JangoMail's API, brings more power, success, and money to Bob's organization. But wait, there's more! The JangoMail API gives Bob's software access to reporting, transactional and campaign sending, contact management, account management, and many more features. Almost everything you can do within JangoMail can be done through the JangoMail API. Check for bounces. Count your opens. Do it all! If you act now, we'll also include the ability to make requests through SOAP, HTTP GET, or HTTP POST. We'll even let you pull the data as string, .NET dataset, or XML. All of this, AND MORE, for the great low, low price of nothing in addition to your normal subscription costs. That's right, access to the API is free for JangoMail customers. Yes, even free trial customers. Want to know more about how the JangoMail API like Bob does? Click here to read more. You'll be cool if you do it, just like Bob. What does a chocolate addiction, reading, and quick wit all have in common? They have EVERYTHING to do with Gayle Barcus, JangoMail's Customer Service Representative! The close-knit group of employees and the company's attention to customer service. My favorite features are the delivery health check and the delivery optimizer tools. A lot of our customers do not know they can start the troubleshooting process on their own. I have an Associate's Degree in Mental Health, but my extensive Customer Service experience led me to this job. Reading and spending time with my friends and family. My only sister is 20 years younger than me and we both have the same parents! 9. Do you have a catchphrase, funny saying, or personal quote? With my quick wit and good timing, everything I say is funny...haha! 10. Anything else you'd like to share about yourself? For the first time in a long time, I genuinely love my job and the people I work with, customers and coworkers alike. Bob has an interesting question. His contacts are all out of line. and Bob's sales team is starting to whine. and JangoMail gives him a way. with wonderful tools to the rim. his list he is starting to trim. The scrub tool identifies bounces. It fixes that typo address. and basically fixes the mess. and Bob never sees it again. while his sales team are working like bees. One of JangoMail's advanced capabilities is its integration with Facebook and other social media. JagoMail's Enterprise level email campaign manager can auto-share email campaigns with social media and Facebook. This feature increases the audience reach of a marketing campaign or message beyond email. Email campaigns can also be shared with Twitter and Google Plus. Facebook and Twitter share statistics can be viewed directly on the JangoMail reporting dashboard. This information provides a way to quantify social effectiveness, as users spread a campaign across social networks. Leverage the power of social media to increase marketing effectiveness by embedding a Facebook Like button directly in an email campaign. Clicking the Like button brings the recipient to a campaign page with a Facebook Like button to like a campaign. JangoMails integration with social sharing sites also includes granular reports for social tracking of visitors. The reports will detail who visits a page and from where and how many visitors and numbers of shares. Connecting Facebook with JangoMail's seamless social integration features will help to broadcast an email marketing campaign faster and with greater ease. The net result is increased traffic and more customers. 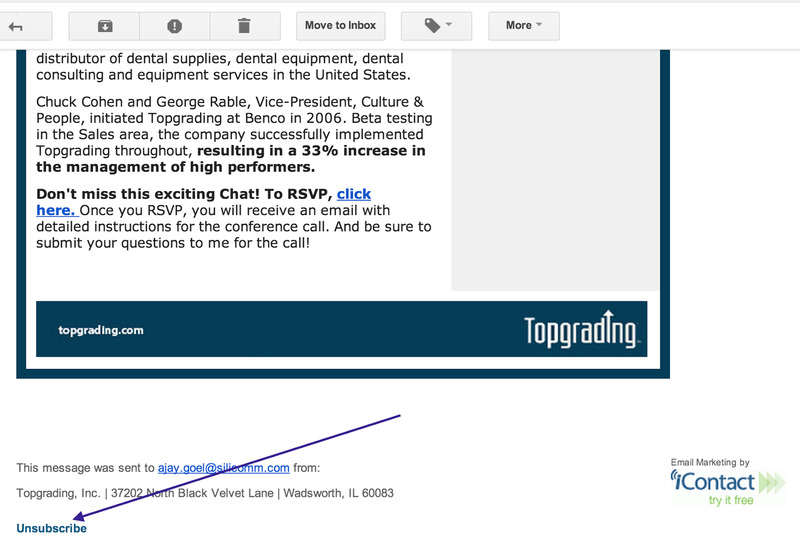 Bob wants to take his email marketing to the next level. He's been sending out his marketing emails, and they've been getting good results. There is, however, a lot of manual follow-up that is required. Bob's sales team spends a lot of time analyzing open and click data, and sends follow-up emails to those folks, to continue the conversation. Bob wants to automate the process of sending follow-up emails to his customers. If a customer clicks on a link to visit the website, he wants to send them an email a little later in the day to follow-up on that visit. If they open, but don't click, he wants to send a different message a day or two later. Bob is using JangoMail's “Triggers” feature to automate his follow-ups. He creates his follow-up messages, and saves them to his account. He then creates a trigger in his account for “Message Opened.” He links the appropriate follow-up message to that trigger. He does the same for “Link Clicked” to catch the clickers. Now Bob's done. When his customers receive a message and open it, JangoMail will trigger the sending of a follow-up message. Bob can have this action apply to only a single message, or to all messages. He can time the follow-ups so they're sent a few minutes, hours, or days later. Bob has used JangoMail's simple “Triggers” feature to revolutionize his customer communication, and free up sales team time for more productive things. The force is strong with this one. Take a look at JangoMail's Trigger features for yourself. Click here for more information on how to revolutionize your own email communications. Gregg Stebben from Stealth Radio Network provides detailed commentary about the robust and automated email blast software features of JangoMail. Special thanks to Jonathan Dwyer from Endicow for creating this video, and JangoMail expert, Stephanie Yount, who performed the demo. JangoMail is email blast software to send HTML email newsletters by using pre-existing templates or by writing your own code. Gregg Stebben is the Founder & CEO for Stealth Radio Network. Stealth Radio Network is a radio news bureau that works with the nation’s top magazines, book publishers, non-profits, global consumer brands, and retailers. So my name is Greg Stebben, and I have an interesting set of things I do in a given week. I'm an editor of a national magazine and also the host of their nationally syndicated radio show. And I also own a small boutique PR firm, and all we do is book radio interviews for our clients on radio. And if you have any experience in radio at all, it's kind of like working in the stock market, things move really fast and you've got to be on top of it. And having a tool like JangoMail makes it essential. Because it's very, very flexible and enables us to do things that are really tightly targeted and very tuned for our audience. What we do is really all about relationships and JangoMail has enabled us to really manage relationships, when necessary, one at the time or in small groups. And that has been an essential part of the tool for us. I've been a customer of JangoMail for probably 10 or 12 years. And one of the things that has really impressed me is that they keep redoing it, making it better, refining it, coming out with new versions. And in the last couple of years the number of revisions they've made on the user interfaces just, they've done some unbelievable stuff. The four main areas that our customers use are the messages, there's not a limit to how many that you can keep track of, so I've got over five pages of stuff that I've done here. Well this was one of the things that they rolled out a couple years ago that absolutely transformed the user experience of using JangoMail. That little search bar over there is so powerful. You can really drill down and find stuff both very quickly and very easily. And you know when you're handling a lot of different email campaigns, that's absolutely what you need to be able to do. You need to be able to pick things out and find what you're looking for. And let me say one other thing that's really powerful that they added. This Identifier column there, it took me a while to figure out how useful that was. But if you're an online marketer or PR person, you may have campaigns with the same subject over and over and over again. You may be resending the same messages. When they added the field for that identifier, it enabled you to add a date or something else unique that separated out today's campaign of the same name from yesterday's campaign of the same name. So Messages is probably the number one place that our customers get their use. Lists is a second area that a lot of our customers use. Whether it is actually creating lists inside of JangoMail, or you can also connect to different local databases. If you have a database running on your computer like an Excel spreadsheet or if you're connecting to a web based database. Assets, this is where you can keep track of images, PDF files, and you can use them inside your messages. There's no limit to how many you can have in your account. We do give you the option to attach files to your messages, but it is a smoother operation if you actually link to it. So you can host them here in JangoMail and then link to them in your messages. And then Reports is probably the most trafficked area across the board for all customers, even more than Messages. Because we do have customers that use our API functions, so they never really even go to Messages, but they do come to Reports. We have it broken down into three different sections. We have Broadcast Messages, we have Transactional Messages, and then we have some management reports and tools. You can keep track of the bounce addresses that occur in your accounts. We'll give you that list. We do the same with unsubscribes. We keep track of any address that unsubscribes. We keep track of the campaign ID number. Every campaign that you send out we'll keep track of the subject line for you, the date and time that it was sent, how many recipients. And then we're going to keep track of the opens if you're using open tracking. And you can actually click on this number. We'll be able to click here and see who opened this message that I had sent out. And it's going to show us that these three people opened my message. And it shows us how many times they opened that message as well. I want to point out a couple of things that are actually not used as much that we're trying to start really showing our customers a little bit more of. So if we could to Lists in the section here called Sending and Receiving, we have two different types of automated messages. One are Recurring Messages and the other one are Triggers. So for both of these, it's an automated system. You could set up a recurring message. So let's say that you know that your company, every Thursday is going to be closed for five hours. You can set up a reminder. The other one that we have are Triggers. And you can create an email. Here what you would do is you'd go in, you'd add a new item. And it's going to let you name the trigger. You would have already created the email itself. You'd go select the message and decide what event is going to trigger this email to go out, the message just being open, a link being clicked, a web page you viewed. Then you can set the behavior. When do you want this sent out? If it's happening every time a recipient performs the trigger or only once. It's definitely a feature that's under used that we're trying to help get out there, because we know a lot of our customers do those type of things, but they're being done manually. And then we have one other automated message that you can set up. And those are called auto responders. And I'd say auto responders are our most used automated system right now. Anytime a recipient is added to a list, if you're using an auto responder you could set up a set of three or four different emails. I know we have several customers that use our auto responders as a set of three different newsletters that they want to go out. One of the things you're going to get if you become a customer of JangoMail, is you're going to be working with a company that's really focused on the user experience and figuring out how to make systems and workflows work really efficiently and effectively and smoothly and easily. What do the initials S.Y., bowling, and 'are you kidding me!' all have in common? They are synonymous with Stephanie Yount, JangoMail's Customer Service Representative! 3. How do you use JangoMail personally? For system testing, customer sending, and automation. 4. What do you like best about working for JangoMail? The customers I work with on a daily, weekly, and monthly basis. The team here is also great! 5. What feature do you like most? The customer support. The fact that we hide nothing, we are upfront about everything, and we offer all of our features at no extra cost! We also offer a full-featured free trial! 6. What is your educational background or what experience led you here? I have worked with the general public since my first job at Krogers grocery store. The majority of my experience, however, has been working with children at a local daycare. 7. What is your favorite hobby / pastime? Other than playing with my kids, I enjoy bowling and playing cards. 8. What is your guilty pleasure? Watching T.V. at night to relax! 9. What is one random fact people don't know about you? 10. Do you have a catchphrase, funny saying, or personal quote? "What the crap?!? ", "It's/that's/you're a HOT MESS! ", and "Are you freakin' kidding me?" 11. Anything else you'd like to share about yourself? The sun is shining out here in Dayton, Ohio and next week is the Fourth of July! Before the fireworks, picnics, and barbecues kickoff make sure your email marketing has a personal touch. Customers respond better to messages that are tailored specifically to them. In order for a successful test, you must send to a list. Personalization will not work by just clicking the “Send a Test” button and sending a preview. When we test our campaigns, I have a special “Jack” test list I’ve created with a few of my own personal email addresses. When I’m ready to preview my campaign I send to my “Jack” test list first. Again, I’m going through the same steps that I normally would when sending a campaign, but just sending to my test list and no others. Always double check your lists before you hit Send to make sure you’re only sending to your test list. Once you've received your message and everything looks good, you’re ready to officially send to your active customer lists or database. To recap: Customers respond better to messages that are personalized. Make sure you test your personalization with a test list in JangoMail. If you need a refresher on how to create a new list like a “Jack” test list, take a look at the list section in our Quick Stat Guide. For a step-by-step guide on how to incorporate personalization in your emails, check out our documentation. Have questions? Ask. Dial 1-888-465-2646 or drop us a line here. Things have been warming up here at JangoMail just as summer kicks off this Saturday! We are very excited to launch JangoSMS. In a few short months you can reach any customer, anywhere! JangoSMS, a unified platform for mass email and mass texting. Customers are on-the-go more than ever and their smartphones go with them! More time is spent on smartphones in the U.S. than TV (CTIA). The average person looks at their phone 150 times a day – 23 of those times at messaging (Tomi Ahonen). Mobile coupons have a ten time redemption rate compared to print coupons (BizReport.com). Want to add something new to your marketing campaign? Try text with JangoSMS. Your customers won't be able to put their smartphones down...even more so than they already do! SMS is PERMISSION-based. You must have express consent to send. It’s best to have a focused marketing plan in mind that includes SMS before you send your first campaign. Set expectations for your customers about what they will receive and how often. The customer shouldn’t opt-in to receive one type of message, and then start receiving a totally different type of message. Keep in mind that your message will probably be read in less than 5 minutes! Make every sentence count! JangoSMS messages are limited to 140 characters. A call to action should be present and the customer’s next step to take clearly explained. JangoSMS will be available in the United States. Subscribe to our newsletter to stay tuned for more JangoSMS news and information. Contact us for more information! When I first founded JangoMail, I would subscribe to as many newsletters as I possibly could, in order to check out the "Powered by ..." tagline at the bottom of emails to gauge which companies are using which email marketing services. It helped me keep an eye on the competition. Recently, however, I wished to clean up my Inbox and decided to unsubscribe from all of the newsletters that I had originally subscribed to for data collection purposes, but never ended up reading. I was infuriated at how difficult most email marketing services' unsubscribe processes are and simultaneously proud of JangoMail's own unsubscribe feature, which is simple, intuitive, and customizable. I found that if an unsubscribe mechanism is too difficult to use, I'm more likely to click my email tool's "report spam" button, which is an easy way to ensure I don't receive that sender's email anymore, but makes me feel guilty for punishing the sender. Focuses on convenience for the user, not on convenience for the sender. Should require two clicks at the most. One click within the body of the email message, and optionally one click on the web page to confirm that the first click wasn't a mistake or a bot. Should be instant on the sender's side. An unsubscribe mechanism shouldn't require "2-3 business days for processing". Should not require you to log in to a website. Should not email you "one final email" to confirm your unsubscribe. An unsubscribe means you don't want any more email from that organization. 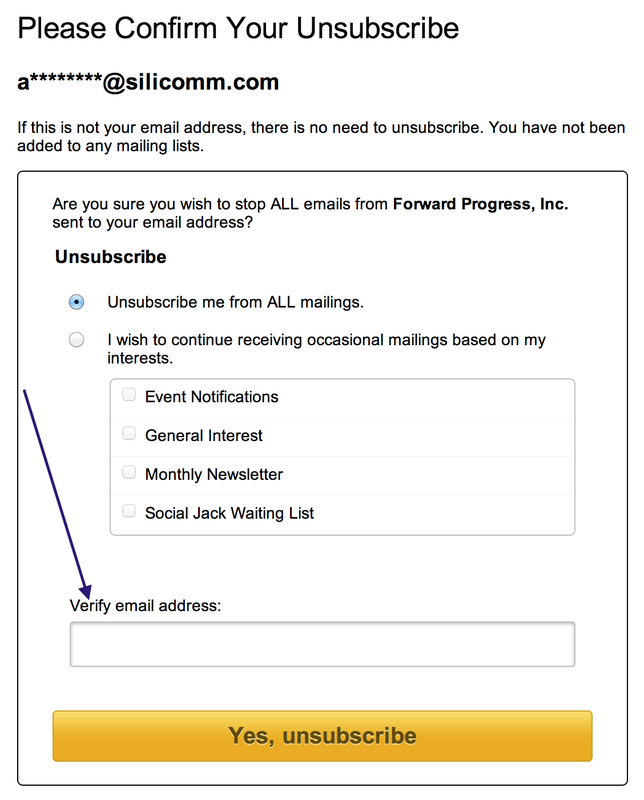 To unsubscribe from an email sent by Constant Contact, you must ENTER IN YOUR FULL EMAIL ADDRESS. This places the burden of the work on the subscriber, not the sender. Therefore whenever I wish to unsubscribe from a newsletter sent via Constant Contact, I click "report spam" to save myself the work of navigating a difficult unsubscribe process. 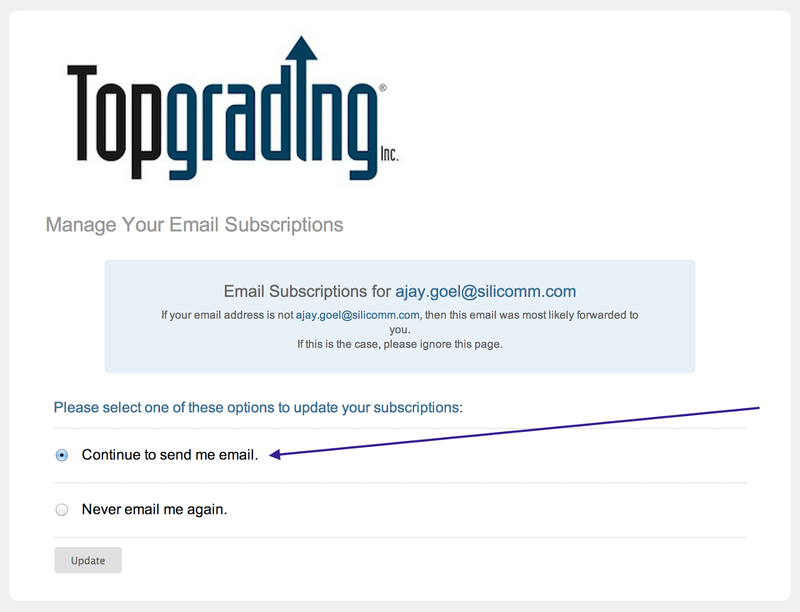 As a veteran and proponent of the email marketing industry, I'm loathe to recommend to anyone to use the "report spam" mechanism in favor of the "unsubscribe" mechanism, since the "report spam" button will punish the sender and reduce their deliverability. In cases where the unsubscribe process is as infuriating as Constant Contact's, however, I'd fully support clicking "report spam" to save the subscriber time. What's even more incredulous is how Constant Contact names its unsubscribe mechanism "Instant Removal with SafeUnsubscribe". There is nothing "instant" about their unsubscribe mechanism. 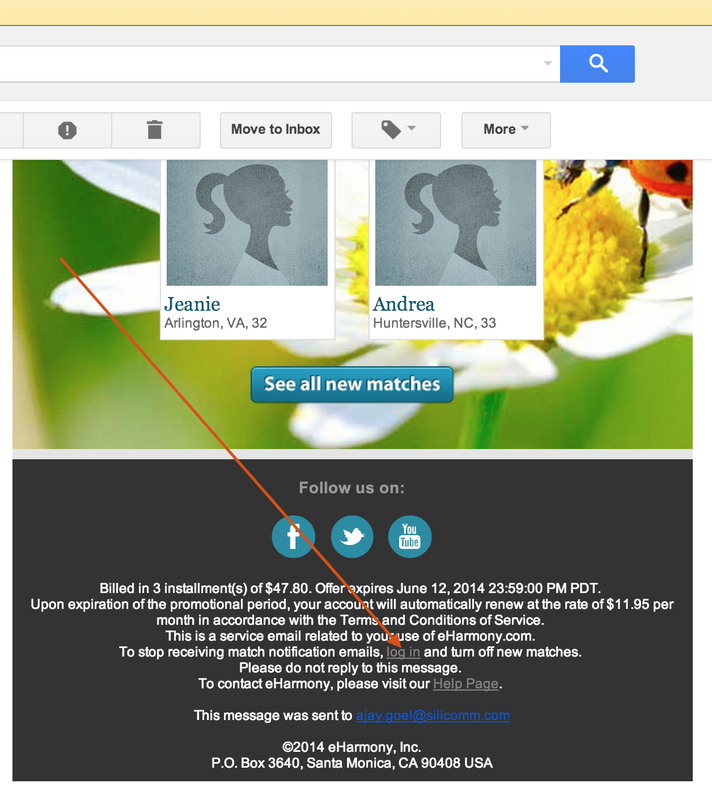 I haven't been a paid member of eHarmony for years, but I still receive their emails. Asking me to log in to unsubscribe is inconvenient and time consuming. As a consumer, I'm more likely to report the email as spam instead of taking the time to figure out how to log in, which would require resetting my password since I can't remember what my credentials are, and then, unsubscribing myself. The Unsubscribe link is prominent and clickable. The resulting web page tricks the user though, by having the "Continue to send me email" selected by default. Why would any legitimate email marketing service set that as the default option after a user has just clicked the "Unsubscribe" link? The "Never email me again" option should instead be pre-selected so that the user need only click the Update button to complete the unsubscribe process. In this example, there is no direct unsubscribe link. Instead the email message provides an "Edit your Email Preferences" link. The resulting web page requires you to enter your email address, and then in what can only be an attempt at a Jedi mind-trick, the bigger more prominent button is the one to NOT UNSUBSCRIBE. This button is useless, since it would be expected that the user would simply close his browser if he wishes to keep the status quo. Early on in my career, I had a Yellow-pages ad saleswoman meet me in my office to sell me an advertisement space in the book. At the end of our meeting, I thanked her for her time, but told her I wasn't interested in buying an advertisement space. She then whipped out a contract and asked me to sign a statement indicating that I was declining to buy a Yellow-pages ad. I was mortified. Can you imagine a world where we have to sign a contract for everything we DO NOT want, versus everything we do want? Don't make your unsubscribe mechanism remind me of my experience with the Yellow-pages saleswoman. Zoniac is an email marketing tool specifically for the IT staffing industry. They impose a 24-48 hour window on when the unsubscribe will take place. Imposing a two day time period on making an unsubscribe happen is akin to having a user go to a website and being told that they must wait two days before the homepage loads. In today's modern world of real-time database transactions and 24-hour connected servers, there is no excuse for an unsubscribe process to take more than a few milliseconds to take effect. Make your unsubscribe link easy to use in order to avoid being reported as spam. A good unsubscribe mechanism is good for email deliverability, and high email deliverability is tantamount to a successful email campaign. JangoMail's unsubscribe mechanism is a direct link, and each client can customize whether the link within the email instantly unsubscribes the user, or whether the resulting web page asks for a second, confirmation link. No 24 hour delays, no entering your email address, no logging in, and no "one final email" after the user has unsubscribed. This is just one way JangoMail delights your subscribers and optimizes your deliverability. CASL (Canadian Anti-Spam Law), pronounced "castle", will come into effect July 1, 2014. You do not have to be a spammer or located in Canada for it to apply to you. If you send messages from Canada or to anyone who may read it there, this new law applies to you. Not sure where your recipients are located? You could ask, use geotracking, or see which emails end in “.ca”. The general purpose of CASL is to prohibit the sending of commercial electronic messages without permission (consent). A commercial electronic message is one that “encourages participation in a commercial activity” regardless of whether there is an expectation of profit. This includes messages to email addresses, social networking accounts, and text messages to a cell phone (Government of Canada). Consequences can be severe. We are only providing a brief summary of CASL. If you feel this applies to you, be sure to consult legal counsel and take the steps necessary to ready your business. For more information visit: fightspam.gc.ca. Proper identification - the sender must be clearly identified and include a valid postal address, and either telephone number, email address, or website which must be valid for at least 60 days after the message has been sent. Consent - if your email message does not meet one of the various exceptions laid out in CASL regulations, you must have consent BEFORE you send an email. Unsubscribe - include a functional and visible unsubscribe mechanism, which must be processed without delay and within 10 business days. The recipient must not be asked to provide any information other than their email address. When is consent not required? There are two types of consent: express and implied. Either can be removed at all times by the recipient through the unsubscribe mechanism. Express consent is very clear and the recipient has taken an affirmative action to give you permission to send to them. Express consent never expires until the recipient asks to stop receiving the message. Implied consent is when a relationship exists, but the recipient has not explicitly asked to receive your emails. If you have implied consent, it is in your best interest to send a confirmation email to gain express consent, which never expires. Implied consent under CASL expires after two years. If a recipient has expressed interest in your product as part of the sales process, implied consent expires after six months. What steps should I take to prepare? It is recommended that you do some “spring cleaning” to your lists by creating an opt-in campaign. Assess if you may be sending to anyone in Canada. Figure out whether you have express or implied consent and track it in your database. Develop a plan to obtain required consent and review your email message to make sure it is CASL compliant. Starting July 1, 2014, you will need consent from any new client and each message must include identification and an unsubscribe mechanism. Where there is an existing business or non-business relationship that includes commercial electronic messages, consent is implied for three years. It is recommended that you acquire express consent for customers that are on your list through an existing business relationship by July 1, 2017. Do not send a message without their consent. Provide an opportunity for customers and clients to say no. Clearly identify yourself and your organization. Please keep in mind that the information provided above does not constitute legal advice and should not be used as a substitute for seeking professional advice. Can I send out an unsolicited email survey for market info, product usage, etc? Whether it is permitted under CASL or not, it depends on whether the message is deemed commercial. JangoMail’s Anti-Spam Policy does not allow you to send unsolicited email without prior consent. Someone gave me their business card. Is it okay to contact them? Under CASL, you would have implied consent for up to two years. As long as they did not specify their wish to be excluded from receiving promotional emails, it would be okay to send messages pertaining to their role. It is recommended to gain express consent. Should I do anything with my existing lists? If you have express consent from all of your existing contacts and have basic records of how and when consent was acquired, you probably will not need to take action with those contacts. If you are unsure of the opt-in status of your lists, or have no records, it is probably necessary to run an opt-in campaign as soon as possible. Part of CASL requires that the sender be clearly identified. My business is a local franchisee. Our franchisor head office sends commercial emails. Is this okay? You will need to ensure your customers have consented to receive messages from the franchisor head office, not just the local franchisee. Is an electronic message that contains a request for consent to send messages considered a commercial electronic message? Yes, it is. You will want to ensure you are following the guidelines when sending. I am sending messages on behalf of a charity or political organization to raise funds. Do I need consent? This is permitted under CASL, but JangoMail’s Anti-Spam Policy is stricter than Canada’s law in this regards. We only permit our customers to send to their own direct contacts with whom they have pre-existing relationships. Make sure your messages have a CAN-SPAM footer! Check out the tools of the v4 Editor or the guide to creating your own basic template. Confirm your opt-in list to ensure warm contacts. Always generate a plain text version of your email. 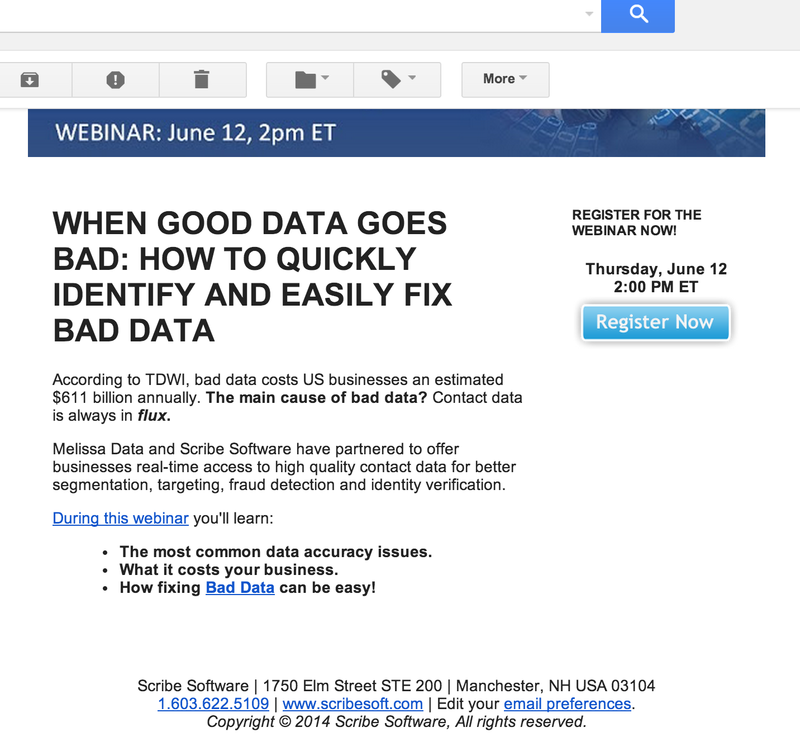 Each time you send out a new email, you should include a plain text version. While most email clients support HTML messages nowadays, there are still some platforms and devices that cannot display HTML. Additionally, there are a few folks out there that prefer to block HTML emails. When you send plain text with HTML, you ensure that your recipient can see your email, no matter what. Need another reason? Spam filters check for plain text because spammers do not include it. A lot of messages without it go straight into the junk folder. Please note that the spam filter also checks for a balance of HTML to plain text so you want to make sure you have an even amount of both. At JangoMail, we make it easy. Once you have the HTML portion of your email finalized click on the second tab in the editor labeled “Plain Text”. You have two options here: you can “Generate now based on HTML message” or “Generate automatically at send time”. If you want to edit any portion of the plain text, click the first link. I prefer this option, especially for newsletters because I like to remove any duplicate links, for example. Choose the second option if you want your plain text to be identical to your HTML message and it will be created when your message sends. The system will generate the latest version right before your message is processed. To recap: Make sure that you always include a plain text version. With JangoMail, you can easily create plain text to ensure your message delivers. Bob's car dealership has been growing. Bob has decided to start a new email campaign to provide service tips to his new car buyers. Bob's idea is to send emails to new car buyers every few days at first, and then at regular intervals thereafter. The first will focus on the newest car buyer, while later emails will remind the buyer about regular service, aftermarket accessories, and other useful tips. Bob knows that his customers do not buy all at once, so his campaign shouldn't run all at once either. He needs each buyer to enter the campaign at the beginning, not start in the middle. Bob uses JangoMail's Autoresponders feature to get it done. Bob creates all of his messages ahead of time so they automatically send out each week, month, and even year. He then uses these messages to create “autoresponders” for his new buyers list. The first email goes out on the day of the purchase, while other messages are set to delay for a period of time before sending. When a customer buys a new car, Bob adds them to his new purchasers list. Automatically, the autoresponders will begin. On the first day, they'll receive a tip email with warranty information and the phone number for the service department. As the days and weeks pass, they'll continue to receive emails tailored to the amount of time they own the car. Bob's customers always start on day 1, no matter what day that is. Luke bought his car on a Monday, but Leia bought hers on Thursday three months later. It doesn't matter. On the day each bought their car, they received the same message. That's why Bob likes JangoMail's autoresponder feature. With autoresponders, he has yet another great way to tailor his email communications directly to his customers needs. Bob's Mom would be proud. Spring is here at JangoMail, and we're sprouting some new service ideas. In particular, we are expanding our full-service and want to hear from you! We have just a few questions to see how we may better serve you. If you would like to offer your expertise in any of these areas as a partner of JangoMail, make sure to check Item #4 so we can talk about working together! What do salt and vinegar chips, mountain biking, and 'refresh your screen' all have in common? They are synonymous with Erick Pece, JangoMail's Director of Technical Support! I use JangoMail both for internal support team use to send notifications, scheduling reminders, etc...I also use JangoMail for a few non-profit projects I'm involved in. The team environment and flexibility to provide customers with the best support options - we're not reading from scripts! I have a background in software development, so my first choice would be our API, since it allows people to integrate with our system directly inside their own. After that, the ability to connect directly to a web database is my next choice! I have a Bachelor's in Computer Science and Information Management, and have had experience as a systems and network administrator at several other companies. The team-oriented environment led me to JangoMail. Baked Salt and Vinegar chips. I can't stop myself when they're around! After graduating college in 2008, I haven't lived anywhere for more than 1.5 years until now. I've been living in the same city for just over 2 years - we're on a roll! I often develop internal tools for our support team to provide them with the best information, which in turn allows them to provide customers with that information. Depending on my workload, I'll sometimes get requests to add features to these tools. In some cases, I'm able to turn around that request in 5-10 minutes, at which point I'll say, "Refresh your screen." I guess I'd say that's a phrase I've become known for by the support team. Welcome to our first Customer Spotlight! Each post you’ll have the chance to read about one of our customers that are making huge email marketing strides using JangoMail. Learn what features they use most and what you can do to improve your own campaigns. This week, I’ll introduce you to iwerk, a software development and technical services company. I had the pleasure of interviewing April Young, iwerk’s Delivery and New Business Manager. Here’s a little background about the company: iwerk, is a software development company specializing in customer software development since 1991. From websites to large database applications, the company operates as a digital arm, offering their clients full technical services. A lot of iwerk’s clients are marketing agencies that need help with online promotions. “Clients come to us because they’ve filled in a large project and they don’t have the resources to build it, so they make it pretty, and we make it work,” said April. That’s where JangoMail comes in. April and her team use JangoMail’s transactional and broadcast service. They work with a lot of clients that have specific needs that many other email service providers will not accommodate. Here at JangoMail, however, we were willing to work with them. When shopping for an ESP, April explains that finding one that could accommodate the needs of her clients was a challenge, until she started working with JangoMail. In addition to our sub-accounts feature, custom reporting and automation were necessities. “Usually one dev. (developer) is working on one project, and one is working on the other, so it’s very nice to be able to give them separate logins,” she said. April’s clients do a lot of reporting. She grants them access to the JangoMail dashboard so they can pull whatever numbers and stats needed each week without interfering with another account. In order for any email campaign to be successful, JangoMail users must use quality lists that people register or opt-in for, not cold marketing emails. JangoMail has a strict anti-spam policy to maintain the sending reputation of our clients, which is key to any successful email campaign. In April’s case, the proof is in the pudding, well, campaign reporting. She has some of the highest open rates we’ve tracked to date. “We’ve had promotions where the email really is the next step in the registrant’s journey,” she adds. Once a person registers for a contest or promotion, they receive an email with a confirmation code and they are redirected back to a website to enter the code in. Without that automation, the promotion will not work. To learn more about April and the iwerk team, check out their website at www.iwerk.com. You can also contact them directly here. They have offices in Detroit, Dallas, and Fort Worth. For those of you who don't know, JangoMail is based out of Dayton, Ohio and we are ranked as one of the 12 worst allergy cities to live in. With the dreaded pollen, I can only anticipate that our team of Jangolopes will be affected. However, I know we'll get through it like we do with everything. Like a bad cold or allergy attack, email deliverability can have many symptoms. There can also be a hidden problem or issue that might take a little more work to adjust, sniffles aside. That's where our Delivery Optimizer tool comes in. Let us take care of the guessing work, so you're not left scratching your head wondering about a specific recipient or list. With a simple check of the Delivery Optimizer you can see what domains you are sending from, and if you have the proper DNS records in place for perfect optimization! Those DNS records are a major factor in whether or not your message passes the receiving server's authentication check. Click here for a step by step guide on our Delivery Optimizer. Don't forget about other tools we offer to improve your message delivery like our Spam Score Checker and Delivery Health Check. The Spam Score Checker can be viewed with any broadcast message. The Delivery Health Check sits right beside the Delivery Optimizer on the reports page and can help you determine why a specific email address isn’t receiving your messages. If you are having trouble with this, just call us up at 1-888-465-2646 from 7AM to 7PM ET Monday-Friday, and we can help.